Each Film Festival has its own strange film to display to eccentric movie lovers. But that, I must say, does not mean that you or me will appreciate the filmmaker’s effort, if the storyline does not appeal to us, or should I say, to our eyes? Well, “She’s Allergic to Cats” is a kind of film that may give you enough room to think about the sanity of filmmaker Michael Reich, whether he was in a right mind or in appropriate mind state to write such a bizarre storyline. Regardless, this is a film you should certainly check to help me understand it better. Mike Pinkney, played by Mike Pinkney himself, lives in Hollywood. However, the job he has does not sound as glorious and stylish as Hollywood itself – he is just a dog groomer who wishes to have a better job in the future. But the rats that eat his banana all the time ruins his plan, as his already shaken sanity is being distracted by the rats who he has no clue how to get rid of. In the meantime, Mike seems to be very busy to think of his personal life, until he meets Cora, who shares the same life interest. In order to turn his first date into a colorful event, it turns out as an eventful night that he could not have anticipated in his uncontrolled mind – that Cora is allergic to cats. That’s right, despite not mentioning that fact in the beginning of my review, Mike does not have cats, but for his desire to spend a rat-free night, our hero gets one to support his plan. Michal Reich’s film is shot in an old-VHS-type-of-video style that allows you to watch his film like if it were shot in the end of 80s and early 90s. Also, experimental short videos added to the film makes it even more strange to digest. It’s not like it’s a bad film, not at all. 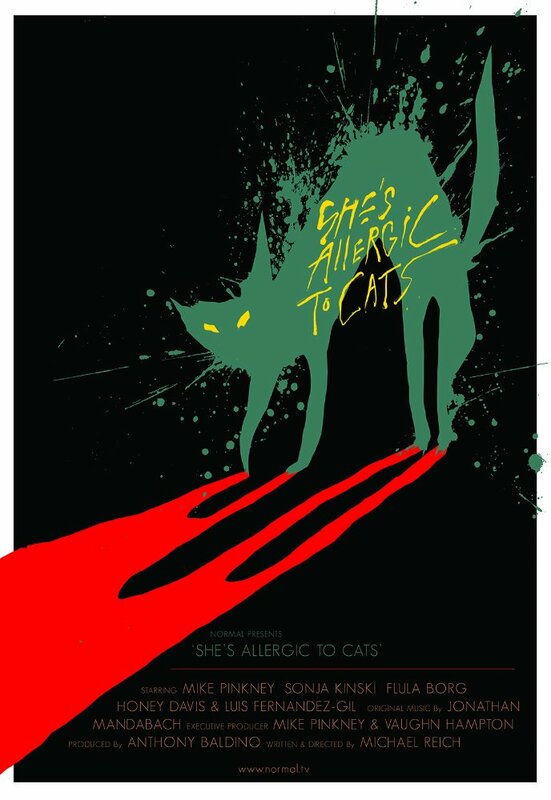 SHE’S ALLERGIC TO CATS is the film that most likely won’t trigger any allergic reactions in you, unless, you like watching easy-going movies. And this one is not one of them. In conclusion, “She’s Allergic to Cats” is an absolutely delightful movie to see. It reminds you what does it mean to have an experimental subject matter, have a filmmaker with a taste and the cast that will help you to get onto the story quickly. Even though it’s Reich who with his masterful hands directs the actors, it still is a queer environment that works so well that believe it or not, no matter in which way this movie would have ended, it simply had no chance but to not fail.